When asked about how long I have been an artist, my response is: “I have always been an artist one way or another.” In high school, I took every art class possible. I began teaching art in 1984, but I needed to feed my Artist’s soul. So I painted on canvases, until I gained access to a kiln and clay. I have been creating organic sculptures in clay since 1994. While searching for a focus for my work, I decided to combine my love for ocean creatures, flowers and plants. Paying attention to the fine details of flower parts and combining them with different elements of eyeless ocean creatures. The unique sculptures that evolved, have a variety of tentacles, seeds, shells, barnacles, petals and coral polyps. My goal is to create organic life-forms that get the viewer to ask how it was made and if it really exists in the world. Commissions are always welcome; feel free to contact me with any questions at fruitoid@aol.com or on my cell at 305-815-9847. If you're ever in Fredericksburg, VA, make sure to stop into my studio at Artful Dimensions Gallery (ADG) to see my work in person. ADG is located at 922 Caroline Street. Born in Norfolk, Virginia and moved to Bucks County Pa. as a small child. While growing up, summers were spent in Long Beach Island, New Jersey collecting shells and admiring the sea life. As an educator at heart, I pursued my two loves, art and teaching. I received a BS in Art Education from Kutztown University in 1984. Shortly after that, I taught art in St. Croix, USVI. While there; many afternoons were spent scuba diving, collecting shells, and photographing and painting the plants and flowers. The incredible hues of the tropics; permanently influenced the color palette for my creations. I continued teaching in NJ and Fl after returning to the mainland in the mid 1980’s. In 1990 and 1992 I had two beautiful boys. In January 1994, I became the Ceramics Instructor at Gulliver Preparatory School in Miami. While there, I helped develop the Archaeological Dig project. I was responsible for authentically replicating pottery, jewelry and even human remains, pertaining to the culture chosen for the Pre-International Baccalaureate Program history students, dig project. In July of 2006, we moved to Fredericksburg, Va. for my husband’sDC job. Once in Fredericksburg, I became the pottery and hand building Teacher at Pots & Palettes. I joined Brush Strokes Gallery in 2006 and was the Vice President from 2008-2011. In 2008, I became the Art teacher at Holy Cross Academy in Fredericksburg. I am a founding member & President of Artful Dimensions Gallery, where my studio is located and where I teach private classes. All of my work is made from lowfire clay, using hand-built slabs and altered or thrown on the wheel and altered. I treat my sculptures like a 3D canvas, underglazes are layered, blended and fired, then a glaze layer is painted on and fired again. 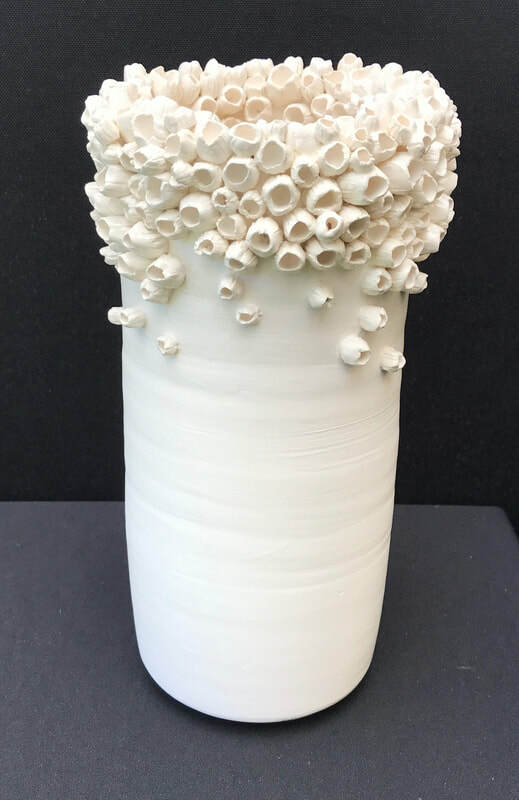 Each barnacle is made one at a time and immediately placed on the piece, then layers are built to replicate a barnacle colony. I have created several different lines of Barnacleware; original Barnacleware started in 2004, extremely barnacle-liked Barnacleware, and hybrid, which is a cross between original and extreme, and lastly white Barnacleware.